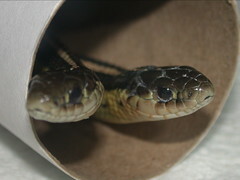 I’ve had two female Butler’s garter snakes (Thamnophis butleri) in my care since October 2000. They were only a few months old at the time, which means they’re now approaching six years of age. That’s nearly three times the record of two years in Slavens (which is no longer being updated), and I’m quite proud of being able to keep them alive for this long. I’ve been wondering when we might start running into geriatric health issues with these snakes. Larger garter snakes can easily pass 10 years (Piss-Boy is at least nine), but smaller natricines seem to have shorter lifespans — Storeria’s record, for example, is somewhere between four and seven years — so Butler’s garters might be similarly short-lived. That time may have come. The smaller, less aggressive of the two has always been a pickier feeder: if any snake is going to go off eating mice during the winter, it will probably be she. I’ve learned not to worry about occasional mouse refusal, so when she didn’t eat last night I wasn’t concerned. But Jennifer reported that she felt limp in hand. This morning I examined her: not only was her muscle tone quite a bit off — despite not being constrictors, butleri have a pretty good grip — but I palpated her and found three hard lumps along her abdomen: two midbody, another a little further down. My first guess would be that she’s got tumours in her organs — the very thing that killed Big Momma, my legendary female red-sided garter, in 2002. And that, my vet told me, was old-age related. It’s less likely that they’re fecoliths, because she’s not (and never has been) obese; and they’re hard lumps, so I’m not sure if it’s steatitis. It’s possible, I suppose, that this is an outcome of a mouse-based diet. I raised them on a mixed diet, as I’ve written before, but in recent years their diet has been almost entirely fuzzy mice. On the other hand, no problems have been reported for long-term mouse diets in garter snakes; it seems to be more of an issue with lizard-feeding desert snakes from the southwestern U.S. (especially the gray-banded kingsnake), and there, if I recall, the lumps are subcutaneous rather than visceral. In any event, my guess is that whatever it is, not much can be done about it.